Some may think that this is impossible to know with any degree of certainty, and to a point it is. Then again, is it really? The answer is no. If we listen carefully to the Bard, Homer, we hear within his extraordinary language the many descriptions he subtly offers us. Vivid descriptions, such as ‘sashed and lovely women’, ‘the Trojan women, trailing their long robes’, or his tag-line description of the Trojan hero, Hektor, ‘Hektor of the flashing helm’. The war-helmets were ‘horse-hair crested’. There are several references to the jewellery that the Trojan women wore, as well as the warrior gear the men sported. At one point in The Iliad, Homer describes Paris as armed for battle, and wearing a lion-skin. We may gather from Homer’s descriptions more information about the types of materials that were available at the time, and even the colour of their clothing. How, you ask? ‘Tis simple; Homer tells us about the materials that were ‘stretched out over the bronze shields’, and the purple dye for their clothing was ‘extracted from murex shells’. The shields Trojans and Achaeans used for protection, were not simply made of a bronze alloy of copper and tin, they also had ox-hides stretched over them, sometimes more than one layer. It is simple words, (or groups of words) scholars have spent hundreds of years analysing that give us our answers However, without surviving physical evidence, how can we be certain Homer was not embellishing his tale? Largely, we have to assume he gave us accurate descriptions, as there is very little written evidence from the Bronze Age. We do however have other forms of recorded evidence to support the Bard’s claims – pottery and statues. Ah hah! Now we’re getting somewhere! How do we know of these? That is where archaeologists and their painstaking attention to details come into the picture. 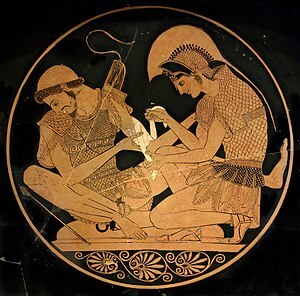 I mentioned ‘Priam’s Treasure’ in one of my other posts, Introduction to the Age of Bronze. This find alone will give us much information about what types of trinkets the Trojans adorned themselves in. Among the findings of arrowheads and spear tips during the digs at Troy, lamb bones have also been discovered, which would almost positively confirm that lamb’s wool was popular. Another interesting item was found in bulk – loom weights. This brings us to a key discovery, and confirms another activity Homer touched on – weaving. The distaff, something women used to use for winding flax or wool, has now been verified in ancient Troy. From the discovery of loom weights and Homer’s text, we know Trojans wove much of their clothing, and dyed it ‘royal colours’ (purple) with the dye extracted from murex shells. Another key note is recorded confirmation of ‘trade expeditions’ through Hittite and Egyptian records. From the ancient records, Homer included, we know the Trojan royalty wore silk. The colours, likely the same as their dyed wool. Essentially, we know Trojans wore woven wool and silk garments. Unfortunately, these materials are all-natural, and therefore biodegradable, hence the reason no fragments of material remain today. The Iliad also gives us detailed descriptions of the battle-gear as well. The Achaean and Trojan armour styles differ somewhat, but both cultures usually wore inlaid bronze protection. Cuirass, helmet, greaves, armguards, and baldric alike, were cited as either ‘adorned’ or ‘engraved’. Archaeology has again proven this is true. Many pieces of pottery discovered in the Anatolian region, (NW modern Asia) depict warriors donned in battle-gear. Well, we do know they didn’t wear pants! This is evident from all the statues, carvings and paintings on walls and pottery showing men in skirts. Now that would be a sight to behold! An interesting fact is that even in the Bronze Age, and perhaps beyond, people throughout Europe and Asia Minor used safety-pins to fasten their clothing, and I am sure they found other uses for them as well. To add to this, I would be remiss to mention that the women also wore make-up. Kohl was a big one, of course for the eyes. The women likely ravishingly scented, as many findings of perfume bottles have been recorded! Although, the perfume of the day was a scented oil. Hair combs made of bone were recovered in Anatolia as well. Seems as though the ladies cared about how they presented themselves. What about footwear? ‘Boots’ is an ambiguous term, but without detailed descriptions, we go by what words we can pick up on. The only one I can find in more than one source is ‘Kothurnos’, (or buskins). This makes sense because, the sandal-type footwear is light and therefore easy to manoeuvre in, but would not interfere with the greaves the soldiers wore to protect their shins. Also cooler in warmer climates. Last thing I will touch on, until I remember something I have forgotten to mention, is the tunic. This is a sleeveless, mid-thigh garment worn by men in Bronze Age Troy. It was also referred to as a chiton, and many pottery and statue have confirmed this attire. One such example is in the above photo, of the Trojan hero Aeneas. Presumably, long robes, like their formal attire, would be cumbersome on a battlefield! Below is a gallery of some items related to Bronze Age Trojan attire… enjoy! Cheers, Amma! Come back soon… next in this series of posts will be ‘What’s on the Bronze Menu’?